Rodeo Drive Resale (http://www.shopRDR.com), premier reseller of upscale clothing and accessories, recaps the latest in designer fashion, runway news and celebrity style. 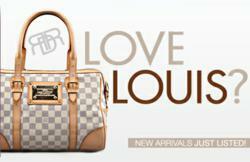 ShopRDR.com offers great deals on one of the world's most beloved luxury labels during their "Love Louis" promotion. To help luxury lovers stay informed on the latest in upscale style and Hollywood happenings, Rodeo Drive Resale (http://www.shopRDR.com), premier reseller of 100% authentic Louis Vuitton bags, Manolo Blahnik heels, and Jimmy Choo pumps, looks at the latest happenings in the world of upscale fashion and celebrity style. WALK THIS WAY: Manolo Blahnik loves style but recently revealed his pet peeve when it comes to stilettos: Women who are unable to wear them gracefully. "I love exaggerated, and I love eccentric, but you must be comfortable. Otherwise it is nonsense. There is nothing charming about a woman who cannot walk in her shoes." The popular designer then offered up his definition of perfection: "Do you know who I think looks wonderful? In Bath, there is a woman who always passes by my house. She wears twinsets, and usually a tweed pleated skirt. Not terribly expensive but good quality, and she always looks just perfect. To me, that's fabulous."